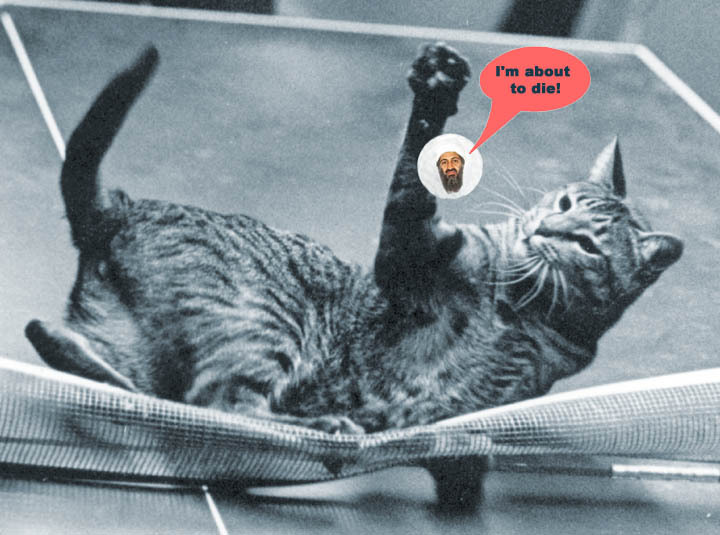 Here's vintage footage of a cat playing table tennis (0.29) - really! - just for fun. There are actually dozens of videos of cats and table tennis in the video section of the Fun and Games section here at TableTennisCoaching.com - why not have some quality time and take a tour? Who knows what you'll find. 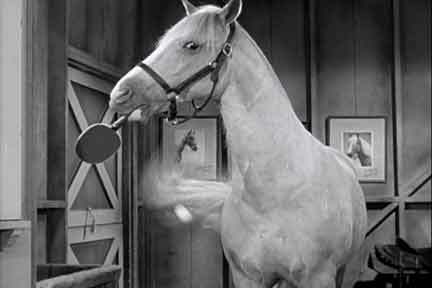 Maybe W.C. Fields playing hilarious table tennis from the 1939 movie "You Can't Cheat an Honest Man" (2:33) or a picture of the horse Mr. Ed playing table tennis (for real, not photoshopped, from TV show "Mister Ed"). Yesterday two of my students - who shall remain nameless - had nice breakthroughs. One, who we shall call "Sammy," who's about 10, has had trouble with his backhand. Yesterday he suddenly figured out how to hit it with topspin (rather than sort of a flat, almost backspin contact), and just like that had a steady backhand. Once he figured that out, his forehand also came alive, and for the first time, we had really decent backhand and forehand exchanges. He also made a breakthrough on service spin. We spent some time serving on the floor, and for the first time he was able to create enough backspin so that the ball would return back to him. You wouldn't believe how fun it is to serve on the floor with spin and make the ball do tricks - use backspin to make it come back, or sidespin to make it go around objects. Another, who we shall call "Ryan," who's 11, went topspin crazy yesterday. His forehand loop really came alive. For the first time, he was able to really battle with me in backhand-to-backhand exchanges. (I had to really get down low and into "match mode" here.) Even more impressive, right after I explained that it takes a rather high level to backhand loop against a block over and over, he immediately backhand looped against my block over and over! Okay, okay, I'll stop trying to limit my students to low-level stuff. His serves also took a big jump, especially his sidespin. He was able to do what I call "The Journey," which I wrote about recently. You stand on your forehand side, and put a box on the far side of the table, down the line. Then you serve sidespin so the ball bounces on your backhand court, curves around, bounces over the net, and continues to curve until it bounces into the box. Here's a table tennis article that bounces around between Warren Buffett, Susan Sarandon, and Nicolas Sarkozy (with playing pictures of all three! ); former U.S. and China table tennis stars Kim Gilbert, Glenn Cowan, and Zhuang Zedong; the "Clash of the Hedge Fund Titans" tournament at Spin Table Tennis; the 19.5 million recreational players in the U.S., a 53 percent increase over the past decade; and has quotes from promoter Alan Williams like, "Everyone should play table tennis. They’ll live longer, they’ll be smarter, they’ll be more attractive," and "I'm talking about Olympians. How often do you get to meet Andre Agassi? You can’t do it. Pete Sampras? Not going to happen. But I can have you in front of a national ping-pong team in, like, five minutes." How can any table tennis player not read this, and still look themselves in the mirror later in the day? It's what everyone will be talking about at work around the water cooler. Well, my water cooler; I don't know about yours. Dear USATT Certified Coaches: Good for you! Dear Non-USATT Certified Coaches: What are you waiting for? One of the funnier moments at MDTTC came about ten years ago when an actual butterfly flew into the club. So one of the kids spent the next ten minutes chasing it with a Butterfly net! (Technically a Butterfly Ball Amigo, but Butterfly net sounds funnier, and it was a Butterfly net being used as a butterfly net.) He never caught the butterfly, but he did chase it out the door. If you are looking for a copy of my book Table Tennis: Steps to Success (not to be confused with the book by Richard McAfee with the same title), you can still buy copies from Butterfly and Amazon, and there are currently four copies on sale on ebay. Plus there's an online version. U.S. Paralympic Champion Tahl Leibovitz - who came within a game or so once of making the regular USA National Team - has put together a series of 21 instructional table tennis videos. There's a 15-second commercial at the start of each (wanna buy some State Farm car insurance? ), then they go on to good stuff. How Osama bin Laden really was killed. He was swatted away at the end of a ten-year cat & mouse game. (The original photo is by Mal Anderson - it's real! Then I got busy in Photoshop...) Send me your own table tennis pictures showing Osama's demise and (if they are in good taste) I'll feature them here. I was watching one of our top cadets in practice matches this weekend. When I coach him, I'm always reminding him to "do something" when receiving. In other words, don't just push the ball back. If you do push it, do so aggressively, i.e. quick off the bounce, heavy, low, and angled. Or aim one way and go another. Or push short. Or flip. And if the serve is long, then you simply have to loop it, period. (Yes, there are exceptions, but they are exceptions. I'm talking higher-level here - but if you want to be good, you'll loop the long serve too. See my March 14 Tip on attacking deep serves.) The cadet, who knew better, was just pushing the serve back, relying on his reflexes and blocking ability to win points - while developing a bad habit. I spoke to him afterwards, and reminded him that practice matches are just that - practice matches, where you practice. Next time, hopefully, he'll use those practice matches to practice. How about you? The ITTF is featuring the coaching seminar I ran at the Maryland Table Tennis Center (April 16-17, 23-24). I'll probably run another next year, maybe sooner. We'll see. If interested, contact me and I'll put you on my email list when I plan another one. "We now have Course Conductors in each region of the country and the Coaching Advisory Committee is working hard to get more regional courses held this year. These courses are completely self-funded and no USATT funds are being used to support the courses. Hats off to Larry, for demonstrating a model to deliver these courses in a way that makes it cost effective for the Course Conductors. The problem with starting any new program is getting someone to go "first." I believe that once our Course Conductors give their first course and realize that it is not that difficult to do and also the importance of the contribution they are making to the sport, we will see regular regional courses being held." My thanks goes to Richard, Glenn Tepper and ITTF, and especially to the 14 coaches who braved the horror of me speaking for (it seemed like) the entire 24 hours. Want to be saturated with table tennis videos? Reflex Sports, the table tennis video outlet, has figured out how to sell table tennis videos in an age where you can find videos of just about anything on youtube. They are selling access to essentially their entire table tennis video library - just about every major tournament since 1985 - as well as video coverage of the upcoming World Championships. It's only $59/year or $89 for two years. Here's where you go to buy access. One of my students bought me a subscription. Any big news from overseas last night? Perhaps a major killing? I just updated the Celebrities Playing Table Tennis page. Updates include Jack Nicholson, Jennifer Connolly, Vince Vaughn, Howard Jacobson, Henry Kissinger, and Nicolas Sarkozy. And in case you missed last update, that included Justin Bieber, Kevin Spacey, Barbara Eden, Ginger Rogers, Susan Sarandon, Walter Mondale, Benjamin Netanyahu, and Rafael Nadal! The page now contains 1178 pictures of 699 celebrities, with sections on Politicians/Leaders, Athletes, Talk Show Hosts, Writers, Actors, Actresses, Musicians, Cartoon Characters, and Other. Send me your own! Here are two videos of Richard McAfee on Ping Pong Planet, a weekly variety show in Thailand. The director and star is Don Mudtangam, who is the "Director of Coaches" for the Thailand TTA. Richard shows up at 4:17 into the first video (14:22 long), and begins speaking at 4:57. He's in from the start in the second video (13:43 long). The others are speaking Thai. In the videos, Richard uses a Newgy robot to demonstrate serve return drills. It will be held at the Newgy Table Tennis Center at 805 Teal Drive, Gallatin, Tennessee 37066 USA. Instructors will be USATT Certified Coaches Carl Hardin and Roger Dickson. First come, first serve basis; Men, women, all ages and all skill levels. Also from their announcement, "See how the Robo-Pong can improve your table tennis skills while having fun and getting a workout all at the same time! This seminar will consist of both demonstrations and hands-on activity with the Robo-Pong and other attendees." If interested, fill out form and email to Newgy Table Tennis. For more information, call 1-800-556-3949 or email. I'm now doing a similar exercise for sidespin serves. For the forehand pendulum serve, I have them serve from the forehand side of the table. I put a box of balls (we use Gatorade boxes at MDTTC) on the far side of the table on the right (opponent's backhand side if he's a righty). The goal is to serve the ball with sidespin so it hits on the left side of the opponent's table, then curves around and bounces into the box on the right. I start by demonstrating it. It's much easier than it looks - try it! How does one go about changing bad technique? Two recommendations. First, exaggerate the proper technique. If you don't rotate your shoulders enough on a shot, practice over-rotating until it becomes comfortable to do it the proper way. Second, drop out of tournaments and match play for a while and focus on fixing the technique. Perhaps hit with a coach a lot for an extended periods as you fix the technique. Playing matches will just reinforce the bad technique. If your goal is to really overcome poor technique and replace it with good technique, then you need to have an extended period where you focus on this. That means only playing with the coach, or doing drills where you can isolate the new technique so you can focus on doing it correctly. You should be able to play without the coach as long as you keep your outside drills simple and focused in this way. You might also want to use videotape to verify you are doing it correctly when the coach is not around. Bad habits are not easy to change, but if you really want to change them, you need a very focused period of time to do so. In general it's best to play lots of matches and get as much tournament competition as possible when trying to improve (along with lots of regular practice, i.e. drills), but when you are making major changes to your game, it's often best to take time off from competition. Perhaps make a goal to have your game ready for tournament competition for a specific tournament (or series of tournaments) six months or so away, and train specifically for that. I don't think you need to take six months off from playing practice matches, but perhaps two months off would greatly help you in making these technique changes. Table tennis in "On the Fast Track"
Table tennis is featured in this morning's "On the Fast Track" cartoon. Yes . . . cartoon cats playing table tennis. Because your day cannot begin until you've seen cartoon cats playing table tennis. After coaching nearly all day (and often night) for ten days in a row (Spring Break Camp, ITTF Seminar, private coaching), I'm declaring today "National Larry's Not Doing Anything Day." I'm spending the day in bed reading. It's a national holiday so schools will be closed, the government will shut down, no postal service, and fire and police departments are all closed - so don't let your house burn down or get robbed today. Sorry for the inconvenience. During the recent ITTF seminar I was thinking about the lack of multiball training in the U.S. In China, players often take turns feeding multiball to each other. In junior programs, the kids all learn to do this, and every Chinese player feeds multiball like a pro, as do most Europeans. In the ITTF seminar, where we had numerous top coaches, few were proficient at this. It doesn't take long to learn, and it's valuable practice. What's faster, learning to loop against backspin one loop per rally, or someone feeding backspin after backspin to varying parts of the table as you loop them all? Multiball allows you to practice just about any combination of shots rapid fire, so you get far more shot practice per minute than with straight drills. (You should do both, of course.) So why not get a box of balls, and next time you practice take turns with your partner feeding multiball? Maybe start the first session taking turns practicing. Multiball allows you pinpoint specific problems and work on them with maximum repetition in a given time period. In China, multiball makes up about 1/3 of their training. Basic multiball technique: Put the box of balls by the net, and pick each ball up and toss it backwards, let it bounce on the table, and stroke the ball at your partner just like any other ball. You'll find feeding basic topspin balls easy, while it takes a little more practice feeding backspin. Here's a seven-video series by Coach Brian Pace that demonstrates and explains multiball training. Not only will you see excellent multiball training, but you'll see lots of high-level technique. Just watching Brian loop should improve your game 100 rating points!